With Sentinel, you can create real-time market alerts that reside on the cloud. These alerts, unlike other platforms, remain active until they are triggered, even if your device is inactive. Sentinel has been live for 6 months and is now a whole lot better with the launch of baskets. You can now use triggers to initiate a basket order on a group of scrips, create equity SIP (Systematic Investing) alerts, longstanding order alerts that can work like GTC/GTD (Good till cancel/Good till day orders), one fires another order, and multi-leg derivative orders. 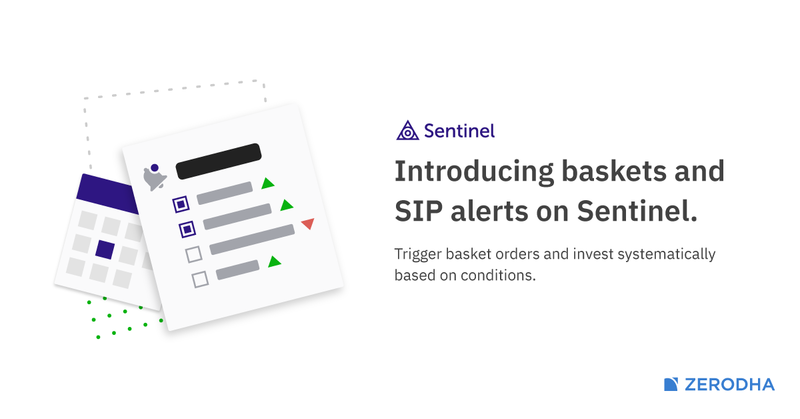 Baskets on Sentinel allow you to create a basket of stocks, ETFs, F&O contracts and then use sentinel triggers to generate an alert which can initiate a buy/sell order for the entire basket. In this example, I have created a basket of Bank stocks and a trigger to execute the basket when LTP of Banknifty is > 26900. When the condition is triggered, you will get a notification on Kite and on your email. When you click on the notification you will be redirected to the baskets page where you can execute the basket. Mobile notifications will be introduced soon. You can now setup a SIP in stocks and ETFs on Sentinel with the new SIP alerts feature. You can create weekly, fortnightly, or monthly alerts as a reminder for you to invest. You can also tag a basket of stocks so that you can execute the basket orders in just a couple of clicks. This feature is available only for Sentinel pro users and through the advanced triggers screen. Currently, all orders on Kite are valid only for a day as exchanges don’t support GTC/GTD (Good till cancelled/Day orders). Baskets feature can double up as a longstanding order alert, similar to GTC/GTD orders. You can, for example, setup a stoploss for your holdings/positions or a buy alert for the stock you’ve been wanting to buy at a specific price. All you have to do is to create a basket with the stocks and contracts you wish to trade, create an alert with price to buy/sell a stock at your price, and tag the basket to a sentinel trigger. When the alert is triggered, you can execute the order almost instantaneously. We have had this request for a long time. If nifty >11000 buy Nifty futures, or if Nifty >11000 buy Nifty 11000 Calls, essentially trigger an order to buy/sell an instrument based on change in a different one. It is now possible using sentinel baskets. Create a basket by adding scrips that you want to trade (Nifty Fut/Options in the above example). Create a trigger on the instrument (Nifty index) which should initiate the order placing alert and link it to the basket. If you are an F&O trader, you can use baskets to execute multi leg strategies. Here’s an example of a bull call spread, if Nifty >11010 Buy Nifty Jan 11000 calls and Short Nifty Jan 11200 calls. I have created a basket with the contracts which is tagged to this condition. I have shown this using advanced triggers available on Sentinel Pro version, but this can also be set using the free basic version. Here’s another example of a Nifty short strangle if the premium of Nifty 10900 CE and Nifty 10800 PE is > 159. Baskets are available on all plans but SIP alerts will be available only on the Pro plan. You can compare the pricing plans here. Check out the Sentinel User Manual to learn more about using these features. You can also interact with the trading community on TradingQ&A if you need help building your triggers. Finally an option like GTC. Better late than never…. Good work! How to place orders on my GTD and GTC ? how to go about it? When your condition is hit, you’ll receive an email alert and an alert on Kite (soon on Kite mobile as well). You can click on the notification and confirm the order. One fires the other – Does it only give the trigger or it can place the order too ? There is a click required. You click on the alert, takes to order form where you place. That is the closest we could do because of regulations. You had always said about constrain to have auto nation in trading but so many people selling auto trading tools like auto trader, presto etc does they do not have any regulation? Since these guys are working on your api what stopping them from auto trader type of tools? Exchange approvals are mandatory for automated trading. It is likely that theses platforms you’ve mentioned has the necessary approvals. If not they are operating illegally. Just curious what is the definition of automated trading here. Where the computer takes a decision on its own in real-time basis some parameters. Or even when it just executes a decision that was taken by some human at some point of time in the past. Any order that follows an algorithmic pattern(even though preset by a human) requires an exchange approval to be made operational. Valid Till Cancel VTC is a new facility offered through ICICIdirect.com using which you can place buy and sell Limit orders in scrips of your choice specifying the period for which you want the order instruction to be valid. The period selected by you should be within the maximum validity date defined by ICICI Securities Ltd. (I-Sec). How does VTC order feature work? When you place a VTC order, you give an order instruction to I-Sec stating that if the order is not executed for the entire quantity, I-Sec is authorised to place fresh orders for the unexecuted quantity in your account on the subsequent trading days till the entire quantity is executed or till the validity expires, whichever is earlier. The feature allows you to specify the number of days during which you wish to place the orders. Your VTC order will remain valid but will be expired at the end of every trade date if the order remains unexecuted and if not cancelled or rejected. At the end of day, after market hours, I-Sec will place overnight orders on your behalf at the same limit price and for the unexecuted quantity for the next trade date provided your validity date is less than or equal to the next trade date. I donnot know what regulation you are talking about. GTC orders are there in KOTAK since long and you need to place GTC order. Once triggered, order placed automatically. please clarify what regulations you are mentioning here. It will good to place automatically once trigger GTC order is set. The response was specific to algorithmic orders generated for which Sentinel gives triggers to the user to be able to execute the order. Concerning GTC orders, there are no regulations restricting it as the order is initiated by the client and remains valid till its executed or cancelled. Good…atlast Zerodha got that feature GTC which could have been a deal breaker for me….. If only BO and CO orders could also be placed in these basket orders, it would have been awesome. Any plans to do so @Nithin sir? We will look into the possibilities of having BO & CO on Sentinel baskets. It would be nice if there is a sound alert on the pc when the trigger fires – a short and sharp ‘ting’ is good enough. Can we expect CFD (contract of difference) on different asset class with mini and micro lots from Zerodha in near future? how to create an alert if I want to buy infy when it triggers LTP=EMA 15 on hourly time frame. Please advise. Indicator based alerts are not available on Sentinel. I usually park my cash in liquid funds. Is it possible to liquidate my funds before executing the basket orders based on my triggers so that my basket orders are not cancelled due to lack of fund? Liquid funds have a settlement period of 1 day i.e if you place an order on Coin before 1:30 PM, you will receive the money in your trading account the next day. So, an alternative is to park your funds in Liquid-bees. When you sell liquid bees the sale proceeds can be immediately used to place your basket orders. I want to invest in ELSS under direct funds. How to do in Zerodha kite site. 2. It would be very convenient for users if every thing is integrated into one Kite app only because with so many new features coming up it become quiet inconvenient to jump from one app to another. Already there are three or four apps (Kite / Coin / Streak / Pulse) and now I have placed a request for Sentinel and sensibull app. If single app is not possible then pls keep only two apps, one for trading Kite and make one another app which combine all other features like coin / streak /sentinel etc. Request you to makewebsite(combo boxes-for picking scripts) and apps for mobile accessible for blind persons to use all features in zerodha. Thanks for Deleting my queries…. I am really to happy if zerodha solve the issue of pivot. Yes.. If zerodha add DAILY PIVOT instead of standard and fibonacy dynamic , just let us add only normal DAILY PIVOT TRADITIONAL IT WOULD BE VERY HELPFUL. it is 1 and half years gone but no support from zerodha end…. thanks you very much for your kind support. I would be very happy instead solving this issue without deleting my query…. what is the key to be a successful trader. Check out this thread on TradingQ&A. Is there a possibility of getting message when the quarterly result of a company is declared? Ah… Triggers on fundamentals aren’t available right now. Opening range is easy to define on Streak – Close crosses above opening range(high,30mins). Do write to support[@]streak.tech to help you out further. We are trying to place the basket orders in kite. Please add this feature to kite trading login. I have seen most of the third party vendors are charging 2000 RS per month to access this future along with other benefits. Please have a look on and if possible implement this basket order future in kite. Thank you zerodha for wonderful Full tools and software in Indian stock market. You can do this on the profile page of Console. Since today morning I am unable to execute my Basket order. Kindly check and help on this. Hey Sandeep, you can create up to 30 baskets under the free plan of Sentinel. You can check out the user manual to learn more about creating baskets. still kite is not 100 percent accessible for blind traders in iphone. not able to add desired script and read deft.